Many of us like colours in general, but will aspire to a neutral palette in the home. White and grey have been around for a while, and it is not a coincidence; they offer a calm retreat in an otherwise busy everyday. Colour enthusiasts will personalize the decor with bright pillows, rugs and art. White purists will have to work a bit more in order to achieve a comfortable interior. White symbolizes purity, cleanness, and sophistication. However, decorating with white is a bit complex as you certainly don't want to end your day in a cold, impersonal room. Luckily, there are hundreds of shades of white out there that you can layer. Woods, fabrics and other natural textures like plants and sisal rugs will warm up the space. Add fluffy details: pillows, rugs, pompoms, tassels... textures and layers will give the space a warmer atmosphere. Ivories, creams and a load of natural textures will ensure a cosy and personal room. Avoid hard edges and shapes, and add tones of personal details. Even though I love colours, I like white interiors when they are well done. The most important thing to remember is that there are many different whites, and not all of them will fit every room. Take time to chose the right tone and don't forget to layer, layer, layer! All white kitchens are not boring! We tend to install one kind of flooring in modern homes with open spaces. The reason is that the place will look bigger, and the flow from a room to another will be natural, without any visual breaks. So, I would say that it is a clever solution. However, when living in a older home (from times when "open living spaces" was a non existing concept), you may wish to keep some existing flooring while renovating or replacing others. Or you may like a durable surface in an area with high traffic. In these cases, a good aesthetic will depend greatly on the transition between the different types of flooring. In addition to being a clever solution, these transitions make for a more interesting room. It is definitely something to consider even in an open living-space. I love bright colours! I simply couldn't live in a colourless environment. What upsets me the most in winter are all the white and grey shades (bare trees, the snowy landscape). However, I love the combo of black & white. In fashion or in interior design, their fusion is so classy, timeless and elegant. Difficult to make it fail! I don't have any "Before" picture of these stairs, but the black & white runner is "dressing" the stairs so well! Another great way to have a chic interior is to paint the doors in black. 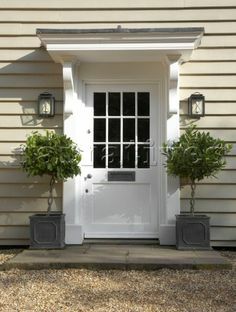 Pretty Practical Home completely transformed its entryway with black & white! So, what are your thoughts on the black and white combination? Classic and timeless or sad and predictable? Sunny days are upon us and there is no better season for nautical decors. Personally, I prefer the nautical theme in beach houses as I am not too found of it in urban places. I love every detail in the living-room presented in Home bunch! The bright and fresh colour palette, and the subtle choice of art are definitely referring to a beach house but in a delicate and very elegant way! First week of November already! We have been blessed by a beautiful autumn and mild temperatures, but I know that winter is around the corner. The glossy image of a Norwegian winter is quiet, snowy roads lined by colourful and pretty houses and kids throwing snowballs at each other. The less glamorous side of Norwegian winter is the entryway full of winter gear, such as dripping boots, heavy coats, piles of beanies, wet gloves... you name it! Assigning a basket and a hook to each member of the family is a great way to encourage keeping the space tidy and allowing quick access to your own stuff. How inviting is this entry? I love some simple hooks on a board and batten wall. I think that the big take away from this round-up is giving a basket or an assigned place to each person of the family. It is easier to make them feel responsible for the organization of their own little basket, than finding volunteers to tidy the bunch of scarfs and mismatched gloves! 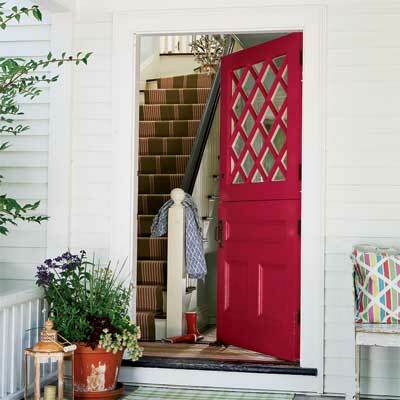 Do you have any tricks in order to keep your entryway clutter-free? Feel free to share them in the comments! Anyone knows about the importance of the first impression. 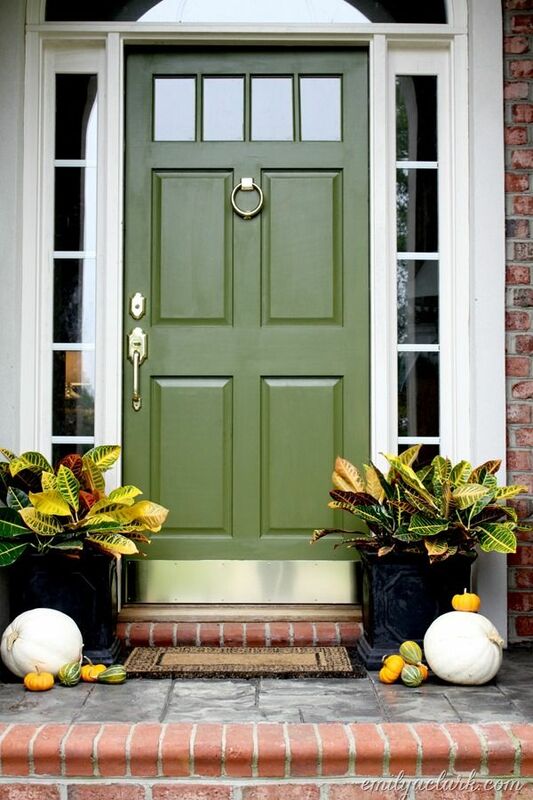 Whether for welcoming guests or selling your house, the front door is worth investing a little time in. As I was browsing on Pinterest, two things caught my eye: symmetry and/or colour. Maybe not a typical choice, but how beautiful and welcoming is this mustard door? The details around the house number are just amazing. I love the examples above because of their simplicity. The charcoal colour, from the picture on the right, enhances the glass frame. 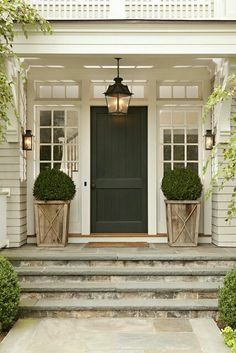 Classic lanterns and planters give a welcoming aura to the porch. Charcoal colour + greeneries = winner! No symmetry there, but a beautiful berry colour for the door. 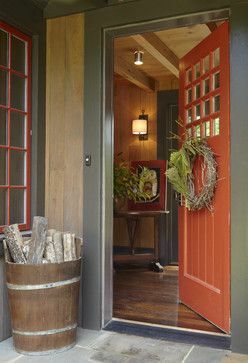 Add a simple seasonal plant and a lantern as a greeting. This door is literally greeting your guest before you open your door! Add a decal on it for an instant positive mood. In the photograph on the left, symmetry AND colour give a sophisticated look. Note the clever use of slim and tall plants in the narrow porch. On the right, seasonal decoration and a wreath add a warm touch . Green olive is back, and very popular in interior design, these days. I love the brass toe-kick at its base, both practical and beautiful. This porch would be as good without the pumpkins, but it is a lovely addition for the season. 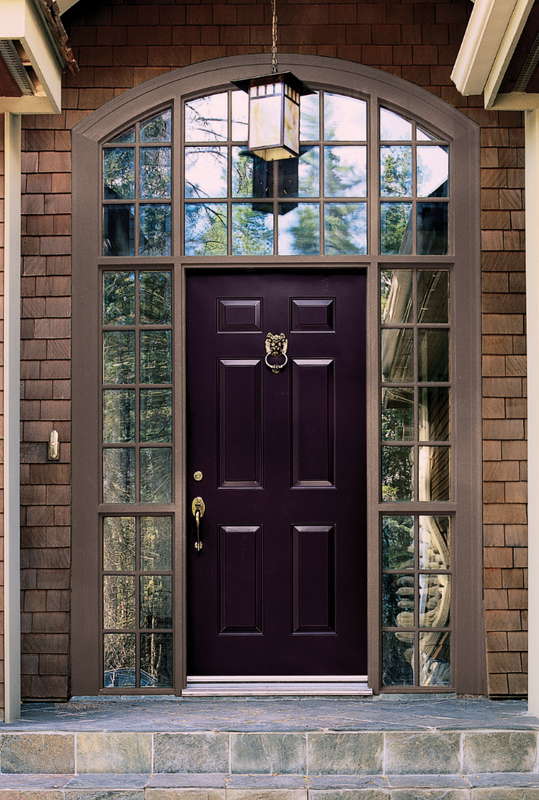 I love, love this aubergine door! It is just as sophisticated as black, but unusual. Bold front doors are not the norm here in Norway, probably because the houses themselves are colourful. 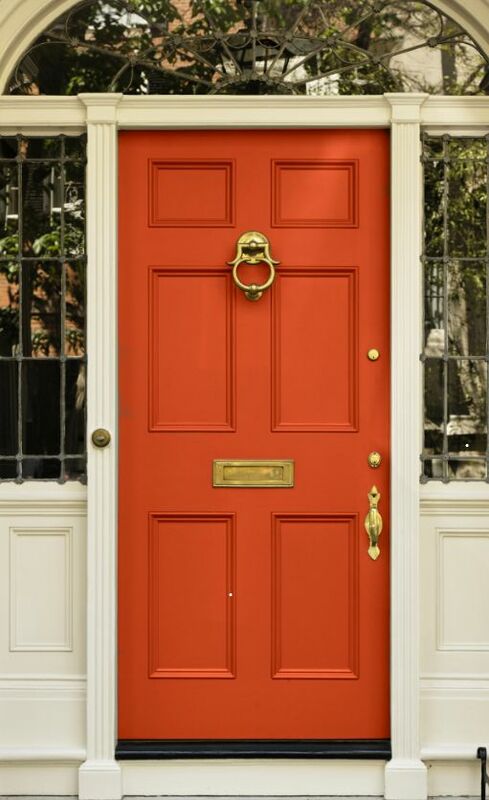 Traditionally, houses are red, yellow or green. White near the shore. 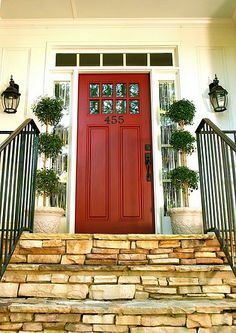 However, the last years, the trend was to paint them white or grey and that's why I would definitely go for a bold colour for the front door . What is the norm where you are living?